Windsurfers are the fastest monohull sailing craft in the world and there may actually be more windsurfers around the globe than all other types of sailboats put together! After a dip in popularity during the late 90’s, the number of people taking up windsurfing is growing once again, thanks partly to developments in windsurfing equipment design that have made windsurfing much easier to learn. Windsurf boards are now compact in shape & lightweight, making for easy carrying & storage. The rigging process is very much ‘plug & play’, only taking minutes to assemble the kit. 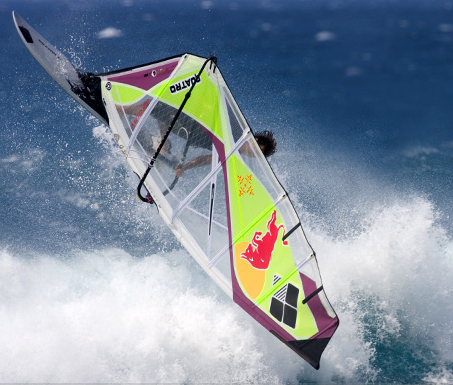 To go windsurfing, you do not have to be a member of a sailing club. Any public beach is a potential launch site. It can be a social sport, windsurfing with a group of friends or equally something you can just get out there and do on your own. Windsurfing is also a sport for all ages, from kids through to the retired. Basically the whole family can windsurf! A big factor towards the increase in popularity is also down to influence of the new skateboard inspired freestyle moves such as Vulcans, Spocks & Flakas. People like the fact that windsurfing gives you the feeling of speed with a hassle free sense of freedom without any regular outgoings to do the sport. You can can take your windsurfing to a level and then just enjoy it or if you want to keep pushing yourself there is always a new skill to learn.